On April 29, Patricia O’Donnell returns to the Final Thursday Reading Series for a release reading of her new novel, The Vigilance of Stars (Unsolicited Press). Set in Maine, this novel takes place across generations and follows a series of interlinked characters facing difficult life decisions. 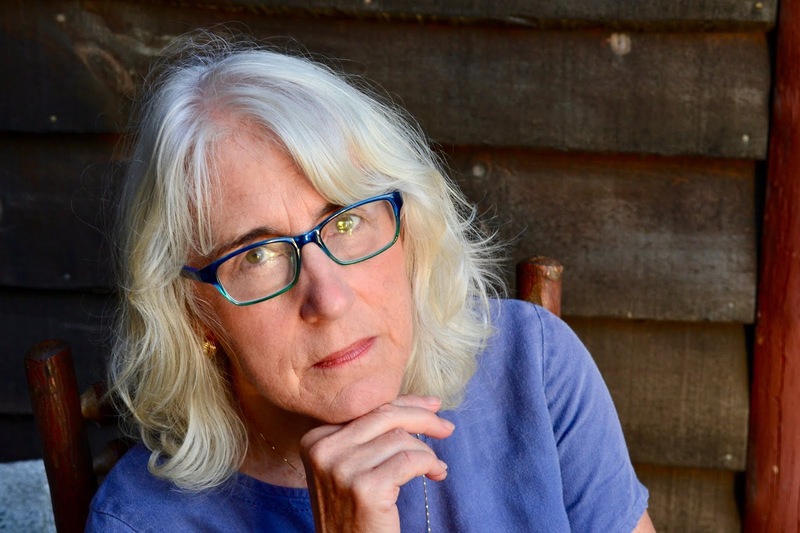 An alumna of UNI and native of Parkersburg, Patricia teaches creative writing at the University of Maine—Farmington. She is the author of several books including the memoir, Waiting to Begin, and the short story collection, Gods for Sale. Though you grew up in Iowa, The Vigilance of Stars is set in Maine, where you’ve lived for many years. Both are largely rural states, but I wonder if you find more similarities or differences between them? Patricia O’Donnell: The small-town life in Maine feels comfortable to me, having grown up in a small town in Iowa. The people of Wilton, Maine, and Parkersburg, Iowa, both have a similar natural and unaffected warmth, and a closeness to nature. In this part of Maine more people take part in outdoor activities, as there are lakes and wooded mountains all over: kayaking and hiking and snowshoeing and skiing and ice skating. And ice fishing. The beautiful land in Iowa is so rich and productive that it is largely given over to agriculture. Maine makes more money from the tourism industry, but not so much here in central rural Maine, which actually has a high poverty rate. Maine is less populated, has more poverty, a higher unemployment rate, and almost three times the divorce rate as Iowa does, my research tells me, and that seems about right. Also Iowa, as part of the Bible belt, has more churches per capita, and religion seems to be a greater part of people’s lives there than here. Maine people are a little more reserved than the more friendly Iowans. Maddie, a main character in the book, is a person who–like me–came from the Midwest, and has lived in Maine for many years. I feel closest to her of all the characters in the novel. 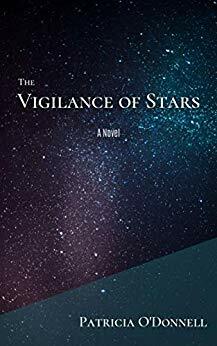 The Vigilance of Stars is a work of fiction, but the book does have one historical figure, the psychoanalyst Wilheim Reich, play a notable role. How and why did you decide to include him in the book? PO: I’ve always been fascinated by him, as a figure. I’ve visited his his lab and research center in Maine, “Orgonon,” which is open to the public. He’s been called a crackpot, but some of his ideas have a beauty to them, a poetry, and his life story is a great tragedy. I read a few biographies of him, and it was fun to imagine him into this book. He was there from the beginning. This novel does a great job capturing varying perspectives of characters at different ages and places in life. Were some of these perspectives harder for you to write from than others? PO: Thank you. It was fun to switch back and forth between characters. For the sections about Evie, a woman in the 1950’s who interacted with Reich, research was involved, but once I figured out how skin cancer was treated in the 1950’s, the rest came easy. It was challenging to write the perspectives of the young people from Portland, Kiya and Peter. I had to check in with my daughter about some things. What else inspired you in writing this novel? PO: We own a cabin on a lake in Maine, and for the story I imagined that cabin turned into a house. An island figures into the story also, and that island is one not far from our cabin. The lake, and the island, and the magic in nature, served as inspirations. Without giving anything away, I can say that this is a book that avoids easy melodramatic resolutions. Situations change for these characters but not because of some perfect answer that pops out of nowhere. What drew you to that kind of narrative? PO: I didn’t want to make things easy for them, because life is not easy, and easy doesn’t make good fiction. Yet I cared for the characters and didn’t want to be cruel to them. I wanted them to end up okay. “Okay” is relative, but I didn’t want to torment them or the reader more than life already torments us. I wanted to see if they, Kira in particular, could deal with some of the very difficult things that life can throw at us. 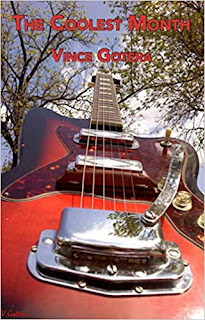 Vince Gotera Makes April "The Coolest Month"
No fooling: April 1 is the release date for Vince Gotera's new Final Thursday Press poetry collection, The Coolest Month. In this interview, he discusses how the collection came about and what drew him to writing poetry in response to prompts. There will be a book release reading for The Coolest Month on Tues, April 9 at 7:00 p.m. in Bartlett 1017 on the UNI campus. The book will be available locally at the UNI Bookstore and the Hearst Center for the Arts. However, you can get a signed copy for $9.95 via check to “Final Thursday Press,” 815 State St., Cedar Falls IA 50613. So, how did the whole idea for this collection come about? Did you have the idea for a book when you started participating in the National Poetry Month prompts? Vince Gotera: Jim, first of all, thank you for providing a home for The Coolest Month. You and the Final Thursday Press have made the book downright beautiful, and I'm very grateful for the fine editing and design. To answer your question, when I started writing April poems in 2012, I didn't have any intentions of making a book of them. I was just writing poems. I knew some of them would end up in my books at some point but I figured that would happen from a given poem coinciding with some organizing theme in a book I might be working on. It was only in the last couple of years, when I realized I had written over 200 April poems, that the idea for a collection came, though I can't really pinpoint an epiphanic moment when it occurred to me. The notion just kind of evolved somehow. What drew you to writing poems in response to prompts in the first place? Some people might find it limiting to be restricted to a particular topic or concept, but you clearly don’t. VG: What drew me to the practice was actually the prompts themselves. Because NaPoWriMo and Poem-a-Day are projects designed to get people — lots of people — writing poems, they both use prompts in order to give those people a leg up in composing. Both projects also emphasize that people don't have to use the prompts at all. It's the writing of the poems that's important. I'm kind of an ornery cuss, though, and when I encounter a challenge, I just have to try to do it. (Unless it involves pain!) Insert smiley emoji. Mashing up the NaPoWriMo and PAD prompts just seemed a natural. As JFK said, we should take on challenges "not because they are easy, but because they are hard." Actually, I can't believe I just quoted JFK. I really do the prompt melding because it's fun and I just wanna see if I can carry it off. By the way, it's April now and I would encourage folks out there to write a poem a day during the month. Here's where you can find the daily prompts: NaPoWriMo and Poem-a-Day. You can also find those daily prompts on my own blog, The Man with the Blue Guitar, along with my poem for each day. 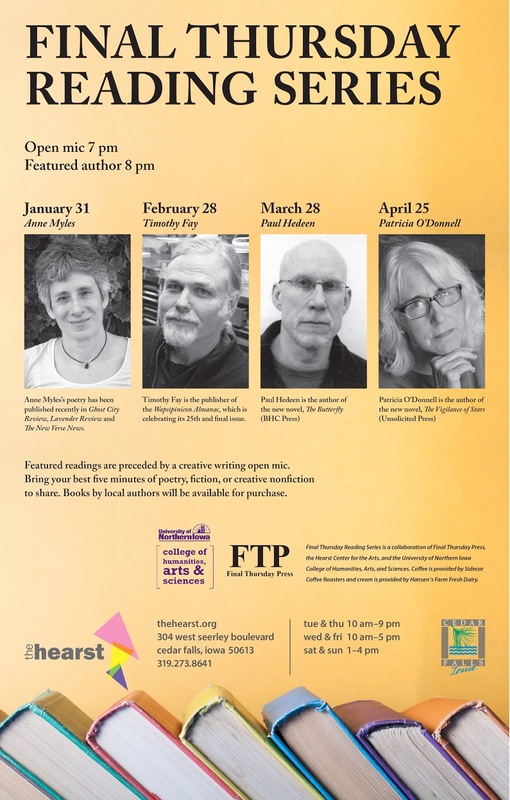 While I'm saying this, I'd like to give a shout out to the poets Maureen Thorson and Robert Lee Brewer, founders of NaPoWriMo and PAD, respectively. They have both inspired thousands of poets, and I'm grateful they provided blurbs for The Coolest Month. Your poetry is distinct for [almost?] never being written in free verse. What draws you to certain forms and patterns like the abecederian or the hay(na)ku or terza rima haiku sonnet (besides the fact that these terms are a pleasure to pronounce)? VG: The very first poem I wrote in early grade school was in quatrains rhymed abab. I don't have that poem anymore but it appeared in the school's newsletter (so I got bit by the publishing bug early). Anyway, that little anecdote shows that I've been very interested in poetic forms for a long time, practically six decades. 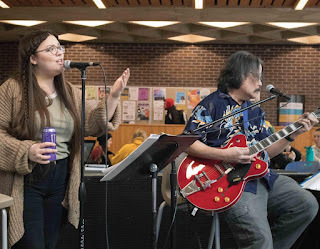 I do occasionally write in free verse but that happens because for that specific poem, I'm feeling that free verse is what will make that poem work. It's rather like my merging of April prompts: I just wonder if I can pull it off. Writing in poetic forms is a challenge I can't resist. In addition, I find when I'm concentrating on form, it actually frees up my mind to be more spontaneous; I make discoveries about the subject that probably would not have happened if I wasn't busy juggling a variety of poetic elements. I love the photo of your guitar on the cover, and guitar geeks have already asked me for details on it. What are the specs, and why did you want it on the cover? VG: Thanks, Jim! That is the first electric guitar I owned, probably from when I was 12 or so (around when the Beatles arrived in the US). It's a Sears Silvertone Silhouette guitar (modeled loosely after the Fender Jaguar). Musicians of my generation often had instruments from Sears and Roebuck as kids. That was just where everyone shopped. In Tom Hanks's movie That Thing You Do, the members of the Oneders band had Sears instruments on screen before they make it big. One of the three prompts for the poem for April 23 in the book was to write an ekphrastic poem — a poem based on another work of art. Well, with ekphrasis comes the difficulty of getting permission to use that work of art when trying to publish the poem later. So I dodged that bullet by just creating my own visual image to write a poem on. I went out on the driveway, held the guitar up to the sky, and shot the photo with my phone. I used that image for the cover because that avoided the April 23 poem being illustrated by a black and white picture. And, besides, I love that guitar and also the image. VG: Yes, there is. People reading The Coolest Month would have the best experience by looking at the notes in the back of the book along with the poems. So poem, note, poem, note. Each endnote provides context for the poem: what prompts I used to write it, and sometimes info on the form of that poem, as well as any background info that enhances understanding. Thanks, Jim! Final Thursday Press is a literary treasure. I'm not just saying that because FTP published The Coolest Month and Ghost Wars (another poetry collection of mine in the early 2000s) but because FTP really is a treasure. To the people reading this interview, check out Final Thursday Press's list — many wonderful books over going on two decades. 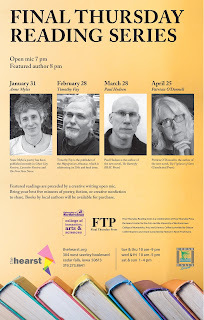 Paul Hedeen is the author of the new novel, The Butterfly (BHC Press), and he will be the featured reader at this month's Final Thursday Reading Series on March 29 at the Hearst Center for the Arts in Cedar Falls, IA (open mic at 7:15; Paul Hedeen at 8:00). In this interview, he discusses what drew him to writing about Nazi Germany and its aftermath in fictive form. 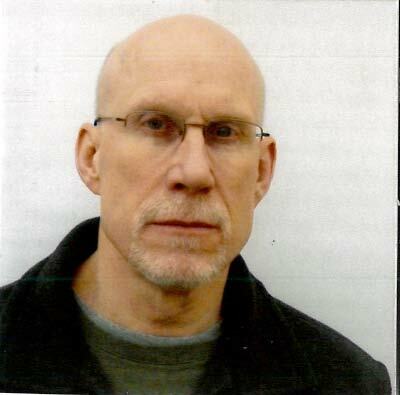 Hedeen is also the author of two poetry collections published by Final Thursday Press, Under a Night Sky and When I Think About Rain. How did you come to write The Butterfly and what drew you to the subject? PAUL HEDEEN: This novel had been taking root in my imagination since the 1970s, when I learned from a roommate he had met someone writing a stage play about Eva Braun. I never learned if that play was finished or performed. I never even learned who the playwright might be. I did think it smart someone could come at a story with the enormity of World War II from an oblique angle, mix fact and fancy, and in the process ask us to experience something new. Since that time many books have purported to do just that and I’ve gobbled up a bunch: Grass’ The Tin Drum, Heller’s Catch-22, Vonnegut’s Slaughterhouse-5, Ransmayr’s The Dog King, Pynchon’s Gravity’s Rainbow, Hawkes’ The Cannibal, come to mind. All were speculative impressionistic fictions, exploring associated languages of dream, history, memory, and desire, a delirium in which we experience history’s affect, rather than its cataloging. In 2008, thirty years after the original suggestion and five years after the publication of my first novel The Knowledge Tree, I was sure only that Eva Braun would occupy the center of my new novel. A few years previously to this, perhaps in 2005 or so, I’d become fascinated with Braun, even to the point of purchasing a few baubles in the memorabilia market I describe in the novel. I even learned of a collector of her clothing with whom I’m still friends. For many collectors, I’ve learned, her death was transcended by a legend seemingly accessible in her “things.” She “means” something and lives on in clothing, silverware, dishware, combs and brushes, and cigarette cases, a lot of it rather tacky, but some of it delicate and beautiful. This is similar to, but I think more personal than, some peoples’ fascination with historical sites. Truth to tell, my influences and ideas for The Butterfly at first had neither shape nor trajectory. Seemingly aimless, the story flitted about like a real butterfly. Not being Proust, I found it difficult simply to associate, to have no sense of a story’s direction. I even thought of abandoning the project. But then, a very crucial influence appeared. Ukraine. More precisely, Vinnitsa, Ukraine. Stuck in the beginning of this project, I went to Vinnitsa on a Fulbright, teaching the American novel among other things. I learned of Hitler’s eastern front bunker nearby and the famous unattributed Holocaust photo concerning Vinnitsa’s last Jew. I attended a conference about the Holodomar, Stalin’s deliberate mass starvation of Ukrainians. As well I learned that Vinnitsa was one site of Stalin’s mass executions during The Great Terror. Suddenly, I went from hardly any story to multiple stories. I understood I could enlarge Eva Braun by locating her in any of these narratives. All of them were at least indirectly associated with her and some directly with her and with her last-minute husband Adolf Hitler. Now I could explore what she means and might have meant to the world around her. But as often happens when the imagination enlivens many characters, they begin to vie for attention. Warren Hart, Olesya and Pavlo Aborovyk, Constanze Kochen, Dmytro Kapailenko, Fortunatus Carlyle, Katrina von Dehlens, David Eisenbraun, and Jürgen Blend shouldered her out of the way. Suffice it to say the canvas, so to speak, became crowded as characters clamored for attention. How did the novel come to be titled The Butterfly? PH: The title comes from Braun herself. 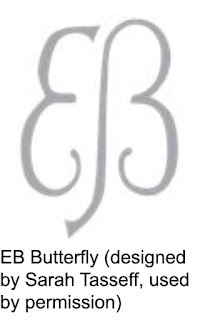 She took the “EB” butterfly as her logo. It was actually designed by Albert Speer, Hitler’s architect and armaments minister. My press incorporated it into my book’s design. I describe it in the novel’s notes. It is represented to the right. Braun wanted these humble and graceful initials to represent her. She put it on everything she could. 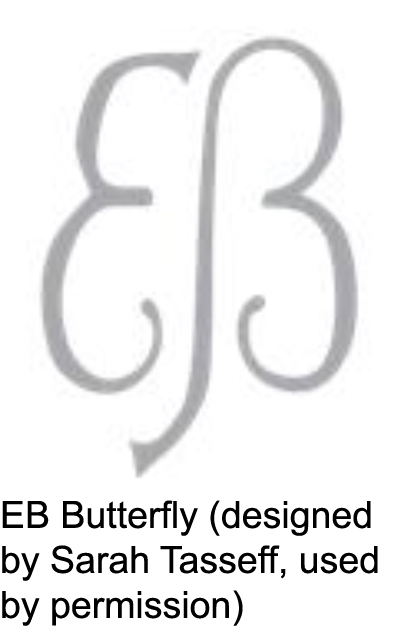 If you have a piece of clothing with this monogram, it is likely she embroidered it herself, or supervised the process. That is how close you can get to her. As with all of us, an endearing pathos attends such overt attempts at objectification. To crave notice, to escape from the chrysalis of being hidden and ignored, is childlike and poignant. Just as in the 1963 world of The Butterfly, Braun has become the sought-after essence of Nazi erotica, beauty, tawdriness, and ruin. While it is difficult to imagine the upper echelons of Nazism as having any innocence, some seems to cling to her. Thus, Hitler, implausibly, is outside the fascination with her, which, like a lot of truths attending human behavior, doesn’t make much sense. She also represents loyalty and love unto death, if one believes the bunker story and can ignore her repeated attempts at suicide. She stood by her man, as it were. But what if this first lady of Nazism had secrets (there were rumors, after all) involving other lovers? What if she somehow survived the Berlin inferno (as Hitler had at first wanted)? What would she have survived to, and where? What if another scenario took over, but her past trapped her anyway, just somewhere else, as if the terrible energies that enlivened her pleasures and infatuations were inescapable? I am less interested in a straightforward answer to these questions (for the historians’ consensus is that she did not survive into the postwar era) than a new experience, an attempt at what the books I named above accomplished. I wanted something speculative (what if? ), polyphonic (of many forms and voices), and impressionistic (associations of atmospheric details and almost accidental reference points). I wanted a book with vivid scenes and a thread of plot, but with enough expressionistic dread to give the reader the histories of those times in new ways. But what history? What new ways? What language in what shapes would create that “something”? 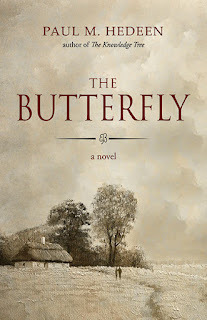 Would you call The Butterfly a work of historical fiction, since it involves a combination of research and imagination? How did you decide when you had done enough research and when it was time to use the novelist’s tools? Fictive history, in contrast, uses history for the building of narrative. (Now Heisenberg is nodding yes, yes.) In fictive history, it is ok to speculate or to locate one’s story in the spaces between facts. Fictive history actually revises the past. I had a story I wanted to tell, facts notwithstanding. The novel’s “the thing,” to quote Hamlet, not the history. 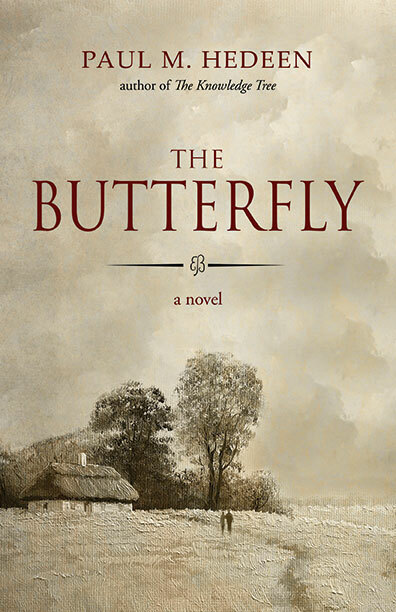 I’m interested in history, as the novel’s reliance on it shows, but The Butterfly is an impressionistic novel. Just as Braun wanted her “brand,” I wanted a speculative story that united some of the disparate places, situations, and emotions I was experiencing. This novel is an act of selfishness. I couldn’t get over myself—just like my narrator, editor, compiler Warren Hart can’t get over himself. The novel points toward what I believe to be a truth, but not a historical one. The truth is that truth is never absolute, but an approximation of ideas and forms of knowing and expressing. One of the things I took away from reading The Butterfly is that the ideology of Nazism can’t be conveniently tucked away as an aberration of a historical moment, and former Nazis didn’t just disappear after the war. How did writing this book impact your sense of Nazism? PH: To create Jürgen Blend I had to read and imagine how a mass murderer would persist even with the knowledge of terrible crimes. All interviews of former Nazis (and their Soviet counterparts) show them as resistant to reason. They were true believers and were able to select out of the welter of philosophy, history, biology, sociology, and etc. the little kernels of quasi-knowledge that supported their positions, rejecting the vast refutation of what they believed. And at the time, many were afraid of what might happen to them or their families if they refused to follow orders. Their legitimate fear (what we all might feel) became a deep cowardice as they rationalized the most unspeakable things. They often rehabilitated themselves—at least in their own eyes—by claiming they acted out of love, a transgressive love for a person, country, or belief. In the case of Nazism, person, country, and belief united in Adolf Hitler. Not only is this love transgressive, it is regressive—refusing the present (the outcome of their beliefs) and the future, a time or idea truly progressive. My challenge as a writer was to create a Blend that was believable, even sympathetic. All Blend wants is to reunite himself with his past. You know, when the people who worked for Hitler described him, he was not the inept strategist and psychopath of most historians, but a kind and considerate figure, a good boss. He was also a bold and direct speaker of fairly simple half-truths. People love a good boss, and they grab onto half-truths. My Zapruder character in The Knowledge Tree is in large part based upon Hitler. Think of Nazism as the Big Mac of naturalistic philosophy, nationalistic politics, historical distortion, economic inequality, and socialistic belonging, all buttered with racial wishful thinking. It was engineered for consumption by the hungry, resentful masses. It lives on today everywhere people make claims for national or racial identity, hyper-masculinity, violence, and fear of the other. Remember what Faulkner said of the past: it wasn’t dead; it wasn’t even passed. The temptations of National Socialism are as aligned with liberals as with conservatives. Remember Vonnegut’s line about World War II: “everyone got a little something.” That’s true of the ideologies of the mid-twentieth century and the politics of our own. This is a wide-ranging novel that not only covers different eras but involves different narrative forms (from straightforward narration to film synopses to endnotes). Was there something about this material that required a more experimental format? PH: My critics, I suppose, will answer no, Hedeen is just being pretentious and obtuse. But I really wanted to express as fully as possible how we come to know things. As well, I wanted to enact Warren Hart’s point of view as thoroughly as possible. He can’t do what he wants to do: create a seamless narrative with the primary purpose of compelling self-exoneration. This is not just a question of competence. The pieces just don’t fit, even with generous intervention. For those of a theoretical or philosophical bent, think of this novel as the play of doxa (opinions and creations), epistemes (knowledge and thought formations), and gnoses (experiences). One way to understand Warren Hart’s situation is to see him as someone desperate to navigate all three forms of understanding (mostly given to him by his student Fortunatus Carlyle) as they pertain to his colleague Dmytro Kapailenko and the shadowy characters surrounding him. Carlyle is on a quest, and Katrina von Dehlens, a trafficked and abused daughter of the Nazi elite, is Carlyle’s fellow traveler. While there is a narrative thread and plot, I wanted also to encourage impressionistic association. Also, I was taken with the idea that every writing form has its own authority. A memoir, after all, has a different authority than fiction or history, even when about the same subject. Everything is different than film scenarios, which are immediate and in the present tense. And fairy tales, or anything with the supernatural, require the facility of belief. They are a repudiation of what’s real or historical. In a fairy tale, Hitler could be Mabuse. The Butterfly is an ambitious and demanding novel. Why not be a little easier on your readers? PH: The subject is huge. Think of Fortunatus Carlyle: how does the past live on in the present? How do we know even what is happening to us as it happens? I wanted to make a correspondingly huge book, like the ones I’ve been taught to admire: an Infinite Jest, Gravity’s Rainbow, or Absalom, Absalom!. Alas, I wanted to make a masterpiece.